Peter Bally was a Swiss-born botanist who worked in Nairobi for a significant period of his life till his death in 1980. He named and described many East African succulents and is commemorated in the names of many, for example the stapeliad genus Ballyanthus (Apocynaceae). Amongst his numerous discoveries are two of the most desirable sansevierias for pot cultivation: S. pinguicula and S. ballyi. Sansevieria pinguicula, prize winner at the 2012 National Show. The plant shown here won first prize in the class for restricted pot size Sansevieria at the 2012 BCSS National Show, where it was photographed by our illustrious roving editor, so many thanks to Trev for capturing my plant so elegantly. In my hands it’s a slow-growing plant, so is ideally suited to the restricted pot class. I grow all my sansevierias as house plants, so most have glazed or ornamental pots as shown here. Plastic pots are a definite no-no for my sansevierias! This species comes from Kenya and was first described by Peter Bally in 1964. He named it pinguicula from the Latin pinguis meaning fat, and -cula i.e. somewhat fat, for the fat leaves. These leaves are indeed very succulent, thick and rounded on the under surface, with a broad channel and distinct pale horny edge on the upper surface, tapering to a sharp point, bluish-green in colour with no cross-branding. The plant branches by producing above ground, raised stolons (runners) that are not covered with sheaths, greyish in colour. The new growth then sends down roots into the ground with the rosette raised above, thus making the plant look like it’s growing on stilts, unfortunately not clearly shown in Trev’s photo. From this the plant has the nickname of “walking sansevieria”. In 2012 S. pinguicula subsp. disticha was named for its distichous (i.e. opposite) leaves at maturity (as produced in many gasterias) as opposed to the typical subspecies shown here in the photo, which has leaves arranged in rosettes. The inflorescence is branched, which is relatively unusual for a Sansevieria, since most have unbranched spikes, and the flowers are very small. However, I’ve grown my plant for 8 years and it has yet to flower. The second Sansevieria closely associated with Peter Bally is very appropriately named after him. The original plant of S. ballyi was collected by him in 1963 (Bally 12681) at Kivuko Hill in SE Kenya. 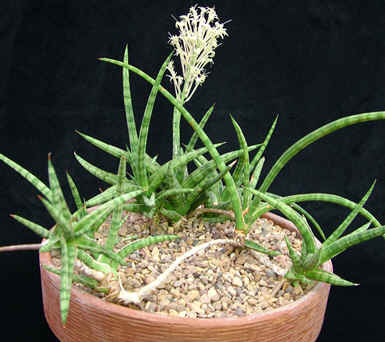 My plant shown in the photo is not from this collection but came labelled as ‘Sansevieria sp. Voi’, but it does seem to match the description of S. ballyi fairly closely. Indeed Kivuko Hill is not far from the town of Voi. Kivuko Hill is a rocky ridge within a large privately owned ranch in Taita District, SE Kenya. The species was only named as S. ballyi by Len Newton in 2004, although it has been in cultivation for a while and is now reasonably common, but it is often still encountered as ‘Sansevieria sp. Bally 12681’. Newton (2004) reports that S. ballyi is plentiful on Kivuko Hill and is thus not threatened. Sansevieria ballyi shown here in a 24 cm diameter pan. Photo: Colin Walker. S. ballyi is similar to S. gracilis in that it produces stolons arising from the bases of the rosettes and so spreads above ground, but it is all round a smaller-growing plant. S. ballyi differs from S. gracilis mainly by its shorter stolons, shorter leaves (up to 12 cm long) with a rough surface and distinctive colour banding of alternating transverse bands of dark and light green and a shorter inflorescence (up to 15 cm long, as shown in the photo, compared with S. gracilis which is twice the size). S. ballyi makes an attractive hanging basket plant with the stolons hanging down. Newton, L.E. (2004). 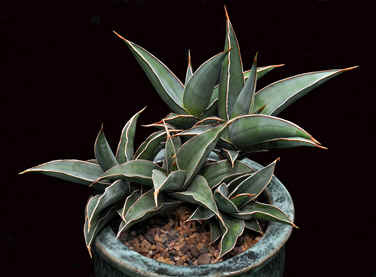 Sansevieria ballyi – a name at last for a long-cultivated plant. Brit. Cact. Succ. J., 22: 10–13.